Swim Plugs - Swimming earmolds or swim plugs are a floatable custom ear mold that offers protection from water and bacteria. These earmolds work well for a patient that has had myringotomy, PE tubes, or any problems associated with Otitis Externa or Otitis Media. 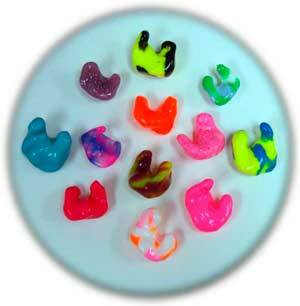 The earmolds are made with JB1000 medical grade silicone and are soft, flexible and proven to effectively seal the ear from water. These are custom made products that fit each year specifically. JB1000 will not shrink or harden with normal usage. Made to last for years of comfortable protection. These earmolds can also be used for general noise reduction when sleeping, mowing the lawn or using household power tools.